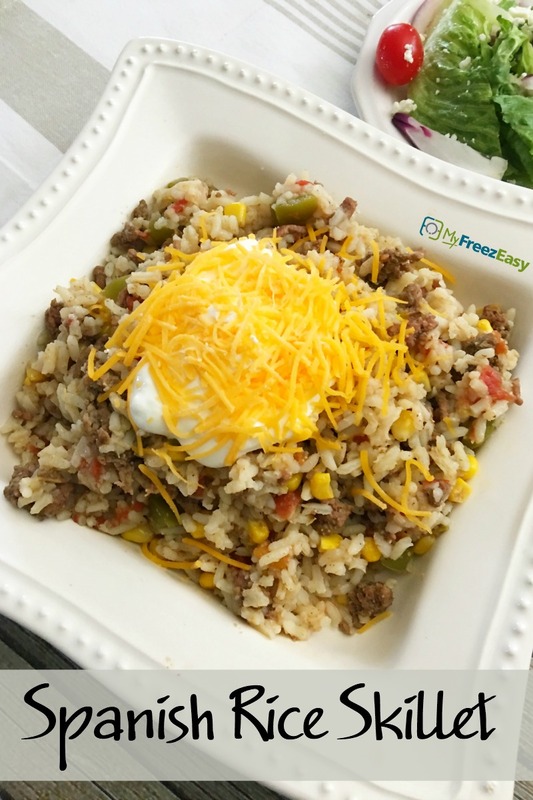 Everything you would find in your favorite Mexican dish, all pulled together into a quick skillet meal! Open and drain the can of corn. In a large skillet, brown the ground beef with the minced onion and garlic powder. Drain and return to the skillet. Stir in the diced tomatoes with green chilies, diced green bell pepper, drained corn, salt, pepper, and cumin. Combine well and bring to bubbling over medium low heat. Stir in 2 cups white rice with 4 cups of hot water. Return to bubbling, then stir once and cover with tight fitting lid. Let cook for 20 minutes, or until rice is tender. Prepare the salad. Slice the avocado. 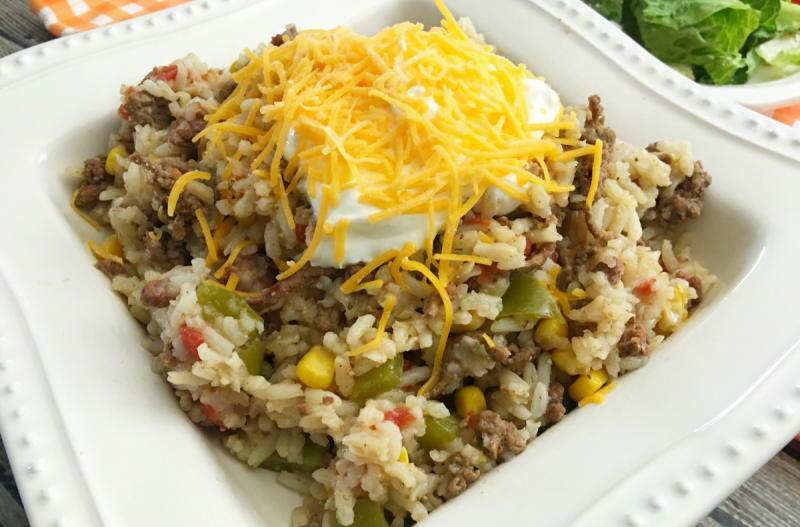 Serve Spanish Rice Skillet with shredded cheese garnish, avocado slices and salad. Brown 2 lbs. ground beef with 4 Tbsp minced onion and 2 tsp garlic powder. Drain and set aside to cool. Open 2 cans of diced tomatoes with green chiles. Put baggie in the freezer and freeze up to 6 months in fridge freezer or 12 months in a deep freezer. Thaw in the fridge overnight, or a warm bowl of water for about 20 minutes, before transferring to the skillet to reheat and then cook in the rice, as directed. If you wish to make this with brown rice, cook it separately and then stir it in with the meat sauce just before serving. Omit cheese garnish for dairy-free meal. Thaw and reheat in skillet. Once warmed through, add 2 cups white rice with 4 cups hot water. Cover and cook for 20 minutes, or until rice is tender. Serve with cheese garnish, avocado slices and salad.